Forum user "Knifegill" went to the considerable effort of writing up most of this CotM and inspired me to write the rest. Most fishes that I've written about for the monthly slot are those which I have kept. This is not one of them, but only for domestic reasons which will become clear. 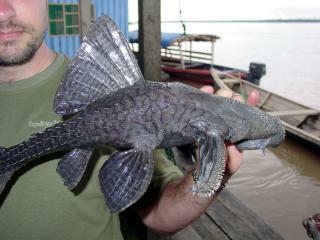 In the world of aquarium catfish, there is a beast, a thorny monster of the Amazon, and it is called hystrix. Across its wide distribution throughout the Amazon it is known by several names such as Carachama mama (the mother pleco) in Peru and in Brazil variously as Cascudo cauda de lira (Lyretail Pleco), Cascudo espinho (Spiny Pleco) and Canana capeta. The species name, hystrix, just means hedgehog. And for good reason. There are many large loricariid species and while Panaque spp. are certainly more massive, A. hystrix may well be the longest, at up to 42" reported in some sources, while more commonly reaching 24" to 30". Longevity of these fish from what I've found is not known, but one would suspect at decade or two for something so large. Many aquariums can be seen with the other species of Acanthicus, A. adonis living with large groups of plecos, however, fewer fishkeepers keep A. hystrix in general, so it's risky to extrapolate this apparently peaceful behaviour to our fish. Furthermore, not many of those keep larger specimens beyond 20" or so. With warnings of aggression, territoriality and outright homicidal nature of this fish on occasion, the aquarist should be prepared to keep it alone if necessary. They also become more aggressive with age, so young specimens may fare better in a busy aquarium than older specimens. 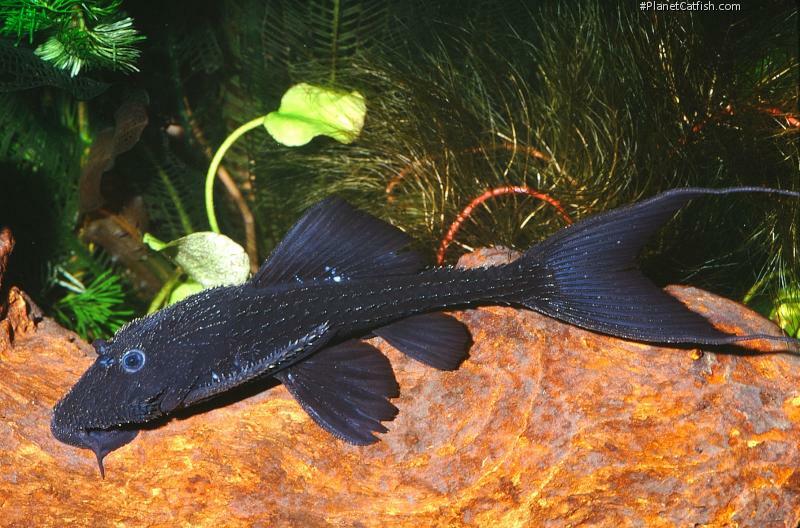 One source reports repeatedly trying to add small fish to their A. hystrix tank, but the pleco would wait at the edge of the tank and impale the little fish with his opercular spines against the glass. It wouldn't eat the fish, it reportedly just wanted them dead. While not a predator, this seems unlikely given the carnivorous tendencies of this species. With an adult size of about 3 feet, you'd ideally be looking at a minimum holding tank of 6 feet by at least 12 feet, the height of the tank normally not terribly important for most bottom-living fishes but given the long leading rays of the dorsal fin and the length of this fish in general, one would want at least 3 or 4 feet of depth so the fish can attach vertically to the walls, and lie flat on the floor of the tank without the dorsal fin emerging from the water. This puts you solidly in the 500g+ aquarium sizes. Seemingly an adaptable fish the temperature can vary from 72 to 80, my individual is healthy and growing rapidly at 74 degrees farenheit. Decorations should be kept to a minimum, nothing heavy enough to break the tank when the fish throws it around. Objects as large as bricks can be moved quickly by adult specimens, so normally just driftwood or heavy cave work (immobile or lightweight) are recommended. Most sources agree these fish are opportunistic omnivores, leaning toward the carnivorous side. Frozen shellfish and other meaty foods are usually taken without hesitation, while vegetables may be eaten but with less fervour. Pellets are a fine staple but watch the ingredients, I lost a specimen to bloat once and boiled the causes down to either excessive temperature or cheap fillers in the feed, no parasites were found upon autopsy. You'll love watching them eat, their massive fins bobbing up and down because of their exaggerated chewing techniques. My individual does eat a lot of wood but is young and this is more likely the search for food than anything else. So, that's what 'Knifegill' has to say on this huge pleco. Whenever this species is mentioned, my mind goes back to when I encountered a particular individual in the Colombian Amazon. In the city of Leticia, as with the length and breadth of the larger Amazon rivers, people build floating houses that are moored, semi-permanently, at the rivers edge. The basic design is huge hardwood trunks tied together made into a platform upon which wooden houses are built. The co-author holds the "local pet"
In walking through a small neighbourhood made of such houses, we found a makeshift bar with a few plastic chairs scattered around a house. Instantly on sitting down, a boy appeared, he was interested in the plecos we had collected. He told us there was a big one under the house and without prompting, dived off the edge of the platform into the river. We ordered a round of beer, very welcome after a day in the river, a short time passed. Our order arrived, and the boy returned. Unusually, the first beer of the day was instantly forgotten because, dripping wet, the boy was holding a massive Acanthicus. The picture here was instantly taken and the fish returned to his murky home. The boy told us he commonly went to catch it to have a look at it. The pleco, it seemed, had grown used to this and was feeding on the scraps of food found around the floating house. It had become something of a pet. A win-win as they say and it certainly became the talking point of our day.